After 'Pukar' and 'Lajja', Anil Kapoor has joined hands with filmmaker Raj Kumar Santoshi again. Not only will he play the lead in the movie, Anil will also associate with the project as a producer. News is that Santoshi is coming up with a film that will be an adaptation of Asghar Wajahat's play 'Jis Lahore Nahin Dekhiya Woh Jamiya Nahin'. While things are still getting finalized, grapevines have it that there will be yet another Kapoor on board. No, not Anil's beti Sonam - but her 'Mausam' co-star, Shahid Kapoor. Talks are that if things fall in place then Sasha will play another lead in the untitled project. The new year also means the awards season will soon begin. And given the multitude of Bollywood legends who passed away this year, one can expect to see a plethora of tributes being paid to the departed greats. And while the obvious choice to pay a tribute to Shammi Kapoor would have been his grand nephew, Ranbir, it appears that it would be Shahid Kapoor who will be grooving to Shammi’s tunes now. “Both Shahid and Ranbir are scheduled to perform at the awards, although for separate acts. While Shahid is working on the tribute to Shammi Kapoor, Ranbir is yet to confirm the details of his act,” says a spokesperson for the channel organising the awards show. 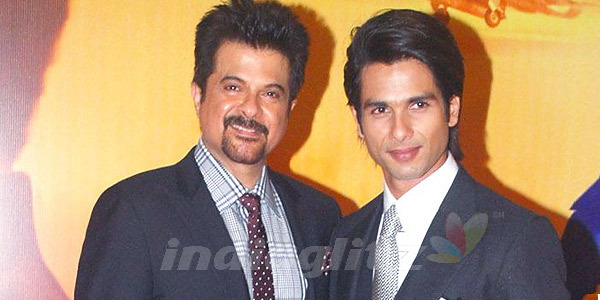 In what is a double whammy for Shahid, he could be paying a tribute to Dev Anand as well at another awards soiree. “It’s a privilege to pay homage to such greats like Dev saab and Shammiji. They are both made invaluable contributions to Indian cinema, and if I can even recreate a fraction of their magic, I’d consider it an accomplishment,” gushed Shahid. Shahid Sonam KApoor once again? Punit Malhotra, who was chalking out plans for his next venture, was all geared up to repeat the formula which worked for his directorial debut, I Hate Luv Storys. However, we hear that his plans to cast Sonam Kapoor opposite Imran Khan for the Karan Johar production are not likely to materialise. A friend of the director's revealed to Mumbai Mirror that Malhotra is back to square one as far as casting is concerned, as Imran has opted out. According to the director's friend, Imran wants to focus on his other films, as the dates for Malhotra's project would come into conflict with his other commitments. The director's friend explained, "After the success of I Hate Luv Storys, Punit was extremely keen to cast Imran and Sonam, as he is very close to them. Punit had spoken about the film to the media. In fact, Dharma Productions were about to announce the film. But then, Imran informed Punit and Karan that he would not be able to do the film, citing date issues. However, Punit was very understanding about Imran's decision." Imran's decision to pull out, however, has come as a major surprise to many in the industry, since I Hate Luv Storys was Imran's first major hit after his debut film Jaane Tu Ya Jaane Na. While the actor has opted out of this project, Imran's friend told Mumbai Mirror, "Despite these developments, Imran and Punit are scheduled to do a film together, but later. Imran is currently dedicating his time to Vishal Bharadwaj's film Matru Ki Bijlee Ka Mandola, which goes on floors very soon." Apparently, Shahid Kapoor is being considered to replace Imran in the film. "If all goes well, this will be Shahid's first film with Dharma Productions, after he had left Kaal at the last minute," added Malhotra's friend.